Bumblebee also creates a community, like bees. Unlike bees, however, also flies cold and rainy weather. At the top of the community stands a queen and a smaller number of workers who collect nectar and pollinate flowers. The life cycle of a bumblebee lasts one season. Nearly spring, the queen climbs out of the cold under the ground. The Queen finds a suitable shelter and establishes a nest in it. The nest grows and new workers are born. In the autumn, new queens will appear in the nest, flying off the nest and buried in the ground. The old queen and all her laborers will still die that year. Only the young queens will survive the next year to establish a new colony. About 30 species of bumble bees have been recorded on our territory. Recently, their numbers have dropped dramatically and some species are likely to be extinct. In a cultural landscape transformed by man, they do not have much opportunity to find suitable shelter or food. But we can build them a bumblebee - a hive for bumble bees. In nature, bumble bees sometimes build nests in tree hollows or rocks. 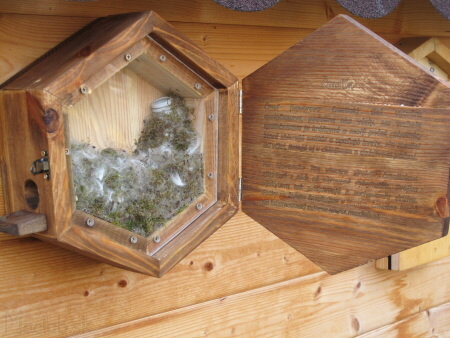 However, they are not able to apply insulation material to the nest, just like birds, and therefore they most often occupy abandoned underground burrows by rodents. We have to imitate these conditions in the construction of the hive. 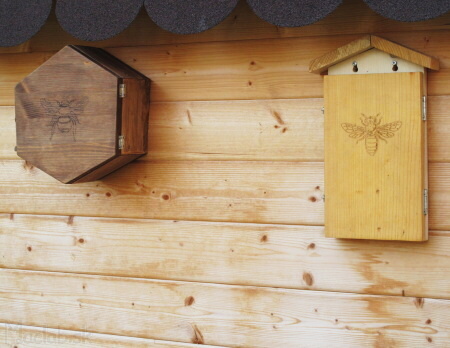 The simplest hive is a wooden box with an entrance corridor and inside lined with wool or other natural insulation material. The shape of the box does not matter, so I decided to make a hexagonal shape instead of a square box. 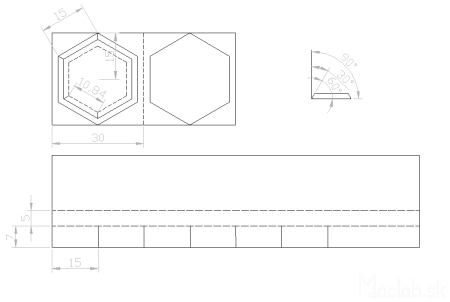 Plans for building a bumblebee house: PNG , DXF , DWG. I used the cuttings from a pine grout to build it. 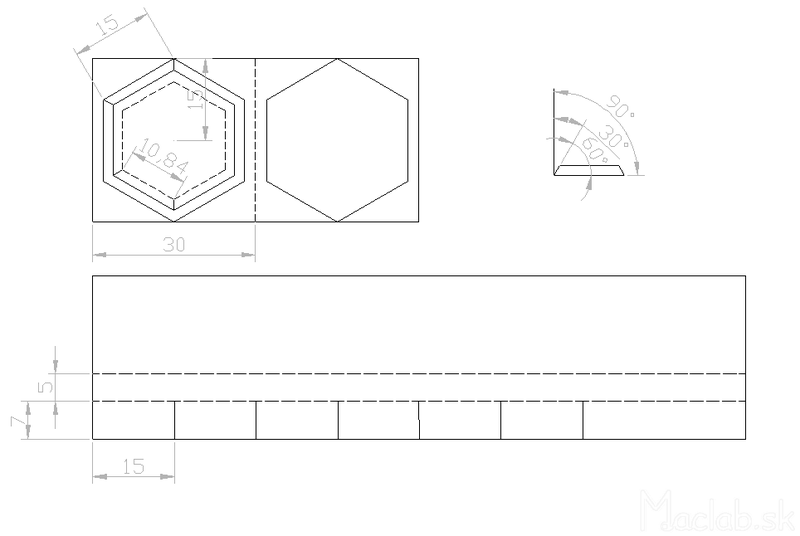 According to the drawing, we cut two equally long plates, with one plate narrower by approximately two centimeters. 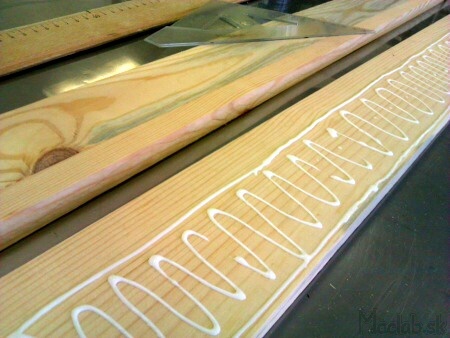 We laminate the boards together and glue them together. 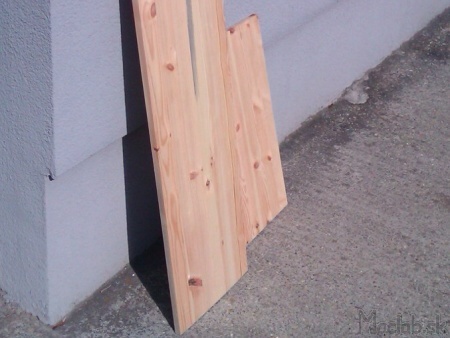 The laminated boards must be cut into individual segments at an angle of 30 °. The two adjacent segments thus form an angle of 60 [deg.] And a hexagon is finally formed from the six segments. 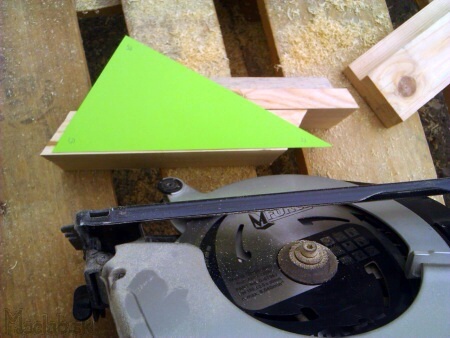 To adjust the tilt of the cutting disc, it is better to use a ruler or a cut triangle from paper. I still insured the two glued segments against the two screws. Put the individual segments on the adhesive tape, glue the contact surfaces and join them into the hexagonal shape. Wrap with rubber strap and allow to cure. From the side, we drill a hole with a diameter of approximately 26mm, which is conically widened so that an electric hose (the so-called neck) of about 25cm length can be inserted inside. We create a few folds on the hose to make the bumblebee feel that it is moving through an underground corridor. The inner space is filled with dry moss, clusters of plants and combed hair from animal fur. 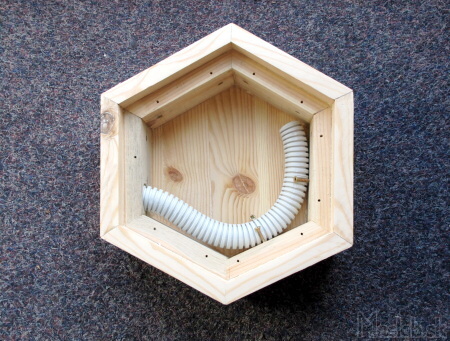 Close the nest with a hexagonal plexiglass. Then trace the hexagonal shape to the board and cut the front wooden door. Coat the outer parts of the bumblebee. I used walnut peel and linseed oil. 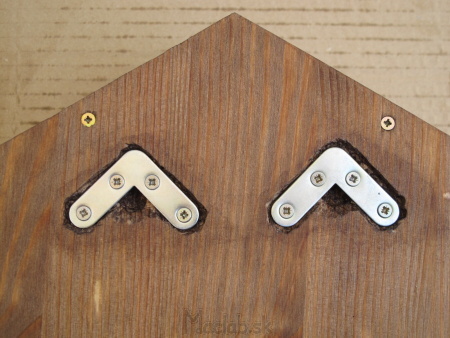 The hinge system can be made from two carobs. 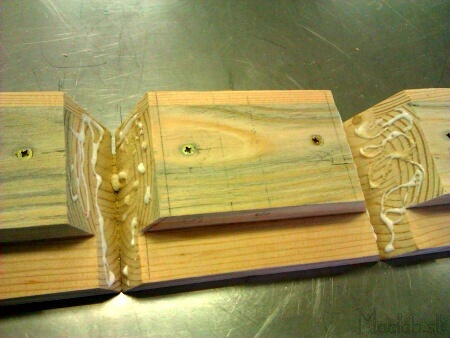 On the floor drill, I set the depth and drilled a number of holes next to each other, creating a recess groove to fit the bumblebee perfectly without a wall-hanging gap. 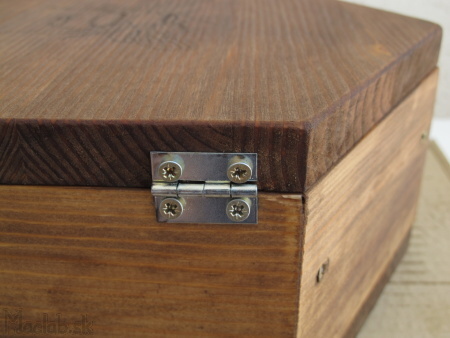 Attach the front door with wing hinges. Then, on the opposite side, mount the latch to close the door. 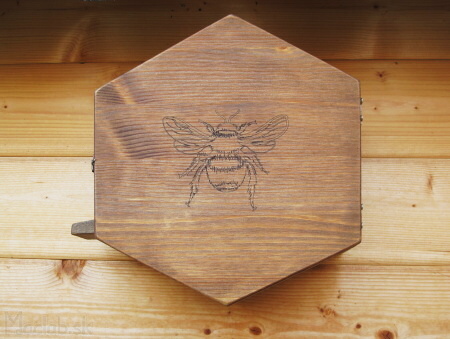 engraved a picture of a bumblebee on the front of the door to make it clear who - what's in the house. From the side, attach a small slanted surface in front of the entrance opening to facilitate landing. Bumblebee enters through the inlet opening, continuing through the goose neck and emerging inside the nest. 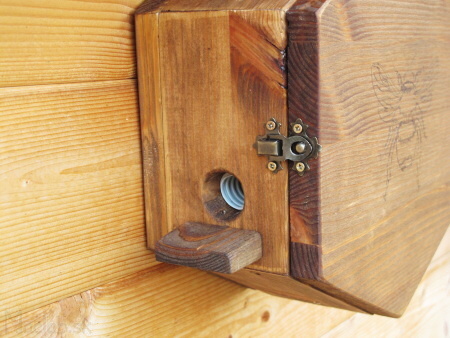 The front door can be opened and occasionally checked inside the nest. Bumblebee and apiary plenty of themselves. 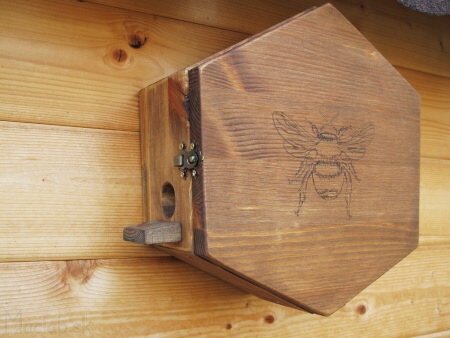 This small bumblebee house is suitable for smaller species of bumble bees such as Field Clover, Meadow Clover, Cmela Rakytovy or Cmela lesny. We place the bumblebee outside on a shady place, and the bumble bees will find it over time. A few weeks after the Queen's settling, when the first workers appear, it is advisable to add a flap to the hive that prevents the parasites from entering the nest.